Baking a healthy cake like my wholesome Gluten-Free Chocolate Beetroot Cake, gives me bone-deep satisfaction. In the last few months, I’ve struggled to perfect the recipe for a gluten-free, xanthum gum-free, light, moist, healthy and unapologetically chocolaty chocolate cake. Past experiments resulted in a few disasters when the cake crumb alternated between sawdust and sand. So, now that I have nailed that dense, intense mouthfeel of a real chocolate cake, (think dark, dew-soaked rainforest soil), I’m taking a moment. Call me kooky but cooking, like spilt ink smudges runs into most aspects of my life, and sometimes makes me question the time, thought and precious elbow grease that I put into it. But on occasion, when an experiment yields a near flawless result, it all seems worth it. 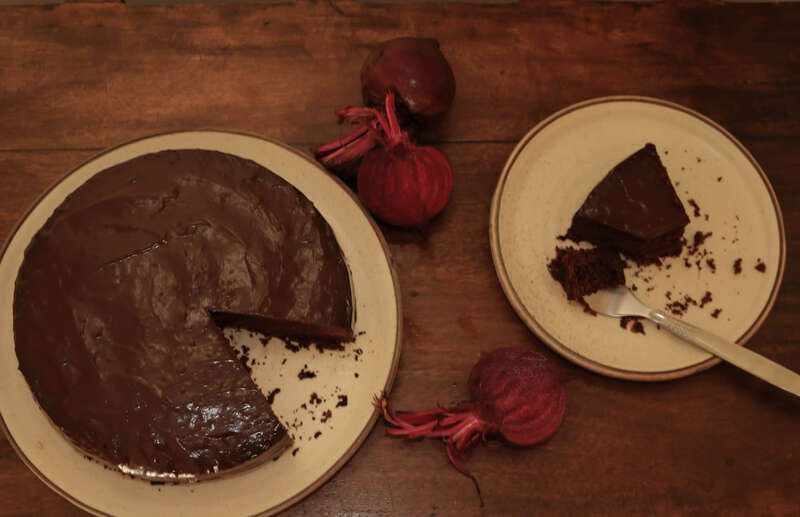 In my experiments to develop a healthy cake, I found that as the bearer of colour and moisture, beetroot is the perfect vegetable to put into a cocoa-based chocolate cake. It balances the acidity and drying effect of natural cocoa with its sweetness, a healthy count of 4.9-5.6 on the pH scale and its generous burst of juice. 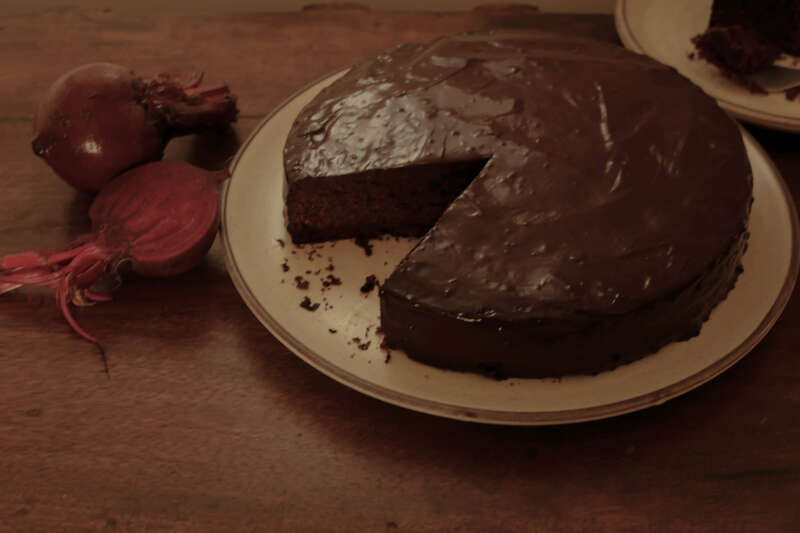 Despite the beet’s strong personality, the cocoa itself does not sacrifice any of its intense chocolate flavour or colour in the cake. A match made in cooking heaven it seems. A combination of oat and white rice flours get lightness with the inclusion of eggs which also give the chocolate cake its body. The slightly gummy oat flour works with the eggs to bind everything and prevents the cake from becoming brittle. I also poured in 100 ml virgin coconut oil. Delicately scented, it lends the cake a richness of texture and the slightest, sweetest hint of flavour. Virgin coconut oil has stolen my heart, it’s aroma floats featherlight (like a gently fragrant souvenir that lingers after a lady has left the room). To my Indian readers, I heartily recommend the extra-virgin coconut oil made by the Coconut Development Board. It surprised me with its clarity and subtleness. Gorgeous. But if you’d rather not use coconut oil, olive oil would be a good substitute. Making the batter for the chocolate cake is quick and straightforward. I had a slab of slightly sweet bitter chocolate and made a simple ganache that I spread over the cake (I am challenged in the cake decoration department given that I’m partial to naked cakes). The result was a lush chocolate cake; an arrow aimed point blank at a chocoholic’s heart. I could eat it for breakfast with a nice cup of coffee, and I did. Beginning the day with chocolate cake. What could be better? Oooh, this looks worth all that experimentation! Looks so deeply chocolately and perfect!